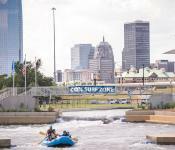 The Boathouse District along the Oklahoma River is a hot spot for outdoor recreation. It's the official U.S. Olympic & Paralympic Training Site for rowing and canoe/kayak and hosts numerous regattas throughout the year. But there's plenty to do for non-Olympians too. Anyone can enjoy kayaking, dragon boating, stand up paddle boarding and cycling, with rentals from the Chesapeake Boathouse. There's also the world's tallest adventure course, the tallest stainless-steel slide in America and more.